THE BEST WAY TO EXPLORE THE RANCH IS FROM OUT OF THE SADDLE! We are on a journey into the year of 1880, when the West was still untamed and wild. Life was rough and so were the people. Experience it much as they did; we offer spectacular views and horseback riding as just one of our feature. Trail rides in this indescribably beautiful and diverse landscape are a producer of unforgotten memories. Our trails will lead you to old ruins of long forgotten days. The Pecos River flows about 4 miles through the North of the ranch and the Carizzo Creek with it’s springs runs about 3 miles along the Northwest border. You can go fishing or swimming in the Pecos River - a highlight in the summer time! The landscape of the Creek Ranch is diversified and offers wonderful trailrides for every horseman/woman. The best way to explore the original ranch is from out of the saddle. Concerning the trail rides, we would like to mention, that the terrain is quite challenging, with e.g. steep up- and downhills and little ditches. Our advise: take at least 10 riding lessons before arrival on our ranch, to really be able to enjoy our trail rides and the rising trot makes it easier for you and the horse. The general weight limit for riders is 210 pounds (please contact us for details). The minimum age for guests is 16 years (younger on request only) and kids under 12 years old are not allowed on trail rides. A lot of work is still traditionally done on horseback, e.g. driving cattle from pasture to pasture, controlling/repairing water tanks and fences or checking the health status of the cattle. Twice a year (spring and fall) there are cattle brandings at which friends and neighbors help, followed by a hearty meal. The friendly and always humorous Creek Ranch team is happy about any kind of help with the ranch work. You will become a part of the family, part of our daily ranch life. You will enjoy the familial atmosphere, because there is a lot of fun! Some days we need help with the cattle. Then you are welcome to help us with cattle drives, re-settling the cattle, preparation of pastures, brandings and health checks and more. We still work the traditional way, as much as possible, from up on a horse. This gives you the best insight of the original way of life of the cowboys. After a hard day in the saddle, we relax on the back porch, look over the Pecos River Valley and eat a hearty meal and enjoy a night around the campfire. 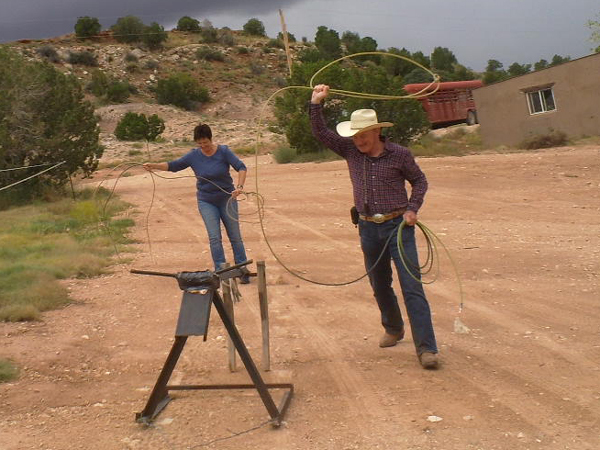 For sure, training in roping and shooting (whoever is up to that) will not be neglected. We don't offer TV! You can watch online (free Wi-Fi in the house avialable) with your own device.